The last year and a half has been one of the most joyous, loving, fun, and exciting times of my life to date. The man of my dreams asked me to marry him in front of my immediate family and we are about to get married, I was fortunate enough to have the opportunity to work for one of the best advertising agencies in Memphis, I have an incredible family who is always supportive, and I have some of the best friends a person could wish for. At this point in my life, other than the trivial material things, there is really nothing that I want for. Of course I am always striving to progress in my career, grow personally, and kindle new meaningful friendships, but overall I am happy. Not a little happy a LOT happy. My fiance brings me flowers for no reason, I can call anyone of friends or family and know that I have someone on the line who will listen to whatever crazy antics I have going on that day, I am healthy, I am safe, I'm planning my dream wedding with my prince charming, I have a vacation planned, really the list of positive things seem endless. I realized I'm walking on eggshells, checking every corner, waiting for the sky to fall. Life, as great as mine has been, has taught me to be skeptical, a pessimist really. The good things have to end eventually and when they do, watch out, right? I have thought that way for many years and now I think I'm changing my tune. I'm trying to get to a place where I can just except that good things will happen and bad things will happen, regardless. I'm not being punished when things get more difficult, I am preparing myself to appreciate the good times even more. 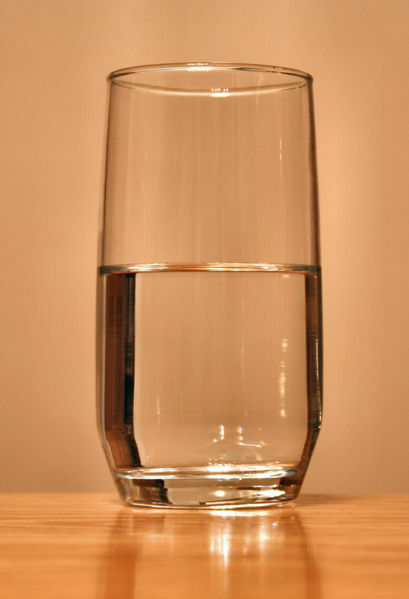 A glass really can be half full. Just relax and enjoy it :) It was good to see you Friday night too! And if you want a partner in crime for this cocktail dress mission, I can power shop like nobody's business!